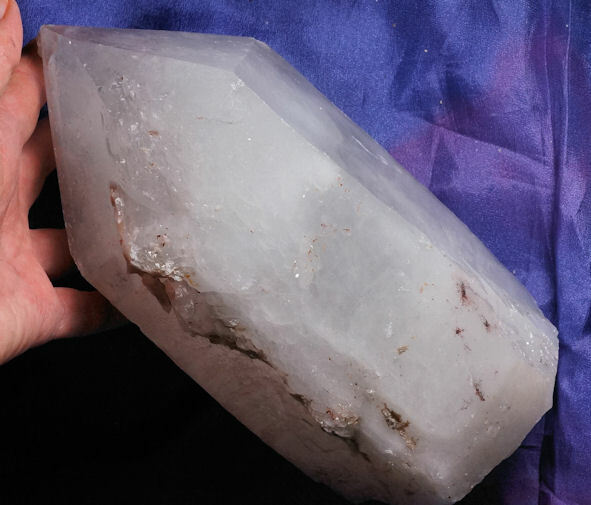 This crystal is another of a new find of quartz in Messina, South Africa, the first location to report ajoite outside Ajo, Arizona and the quartz has amazing and angelic energies. These mines have long been flooded and any crystal from Messina is rare and precious. The famous copper mines there have been closed down for some time and all of the original quartz mined was becoming rare. New finds have opened up and the quartz is nothing short of amazing, although sadly, these mines too have closed making these quartz treasures to savor. This is a 7 lb 3.4 oz, 8.4 by 3.9 by 3.4 quartz crystal with a faintly tinted hematite termination and three sides coated with a thin layer of golden healer stained calcite. Her other sides are beautifully Lemurian lined and there are rods of red piedmontite and green epidote. Her faces are covered with glyphs and if you catch the light just right, there is a kind of golden iridescence on top of the hematite tints that is adds to her aura! Also, there is a small stargazer student embedded plus a number of trigonic record keepers. Her energies are soft and heart-felt and she would love to work with a Keeper searching for their Lemurian roots. Epidote is a wonderful Spirit for enhancing personal power (in a positive way), while also allowing Spiritual growth and development. The blend of both red piedmontite and the epidote is very balancing and seeks to align the core as well as the heart. This is a magical, magical combination ... the balance is sublime and set in this already Spiritual host quartz from Messina, well ... it is beyond sublime! This is a wonderful Spirit for those trying to assimilate the vast array of sensitivities and energies they are experiencing, freeing up the physical expression and putting the energy movement where it belongs ... in addition, there is a new Lemurian awakening in this time and some feel that 2012 ushered in the New Age of Lemuria. New Lemurian crystals are appearing from every corner of the world and from areas traditionally not thought to spawn Lemurian crystals. When I got the channeling for the Blue Tara Lemurians, I was told that the Lemurians knew of the pending destruction of their island and then encourage their people to spread to all points on Earth, together with the Lemurian seed crystals so that at the proper time, the knowledge could be awakened. As I opened these special crystals, the hair was literally standing on the back of my neck ... it was an experience I'll never forget as I felt I was entrusted with the most sacred crystal ever to see the sun's first light. I sobbed, I processed, I admired, I savored each one and know that one by one, they will go to a special Keeper who will be part of the Lemurian Awakening. This is an important Spirit for one who would be among the valiant and stalwart Keepers of these Jewels of Lemuria! And because her ajoite is softer in nature, this opening is more gentle (if that's possible) than the intensely colored Messina quartz. She is actually perfect for working with a child or a Keeper who has been very ill and needs gentle healing.